We are situated in an equestrian community of Albuquerque's North Valley, and, as you may have guessed, I serve raspberries at breakfast all year round -- fresh in season, or out of the freezer off season. (We pick 150 gallons.) Jams and jellies from home-grown fruit also grace the breakfast table along with fresh baked breads. The chickens who provide our eggs live in the backyard, and seasonings come from my herb garden. 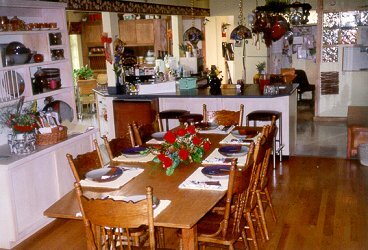 This and other Albuquerque New Mexico Bed and Breakfast Inns can be found here in The Register.